Seasonal cooking – it’s just the best. The best because when the food markets are abundant in a particular seasonal fruit or vegetable for just a few weeks, we get over-excited and buy far too much of it for two people. And that’s when we’re forced to get creative and learn new recipes. This is a recipe we discovered – and adapted – recently so that we could use up our glut of yeşil erik (greengage plums) that was sitting in the fridge: We’re making erik tavası. Whilst it’s great to sit on the balcony in the sun, feeling the fresh crunch of icy cold yeşil erik as you bite into them and dip them into salt, it’s also been a great exercise doing some online research for other erik recipes. Not just Turkish but also British and from around the world. After discovering that Turkey has an erik tavası recipe (a Turkish greengage stew, for want of a better decription), this was the recipe I set to work on. Why ‘our take?’ Well, for starters, erik tavası is a popular dish in Gaziantep and is usually made with beef. Our erik tavası was all about clearing the fridge. As well as a bagful of erik, we also had a chicken breast that needed to be cooked. So, chicken is our meat for this recipe. 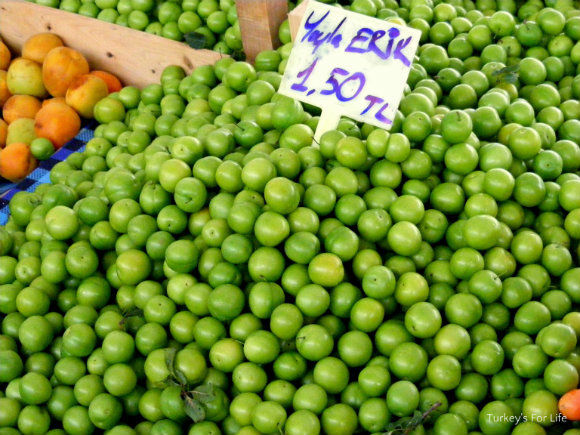 Before they truly ripen, yeşil erik can have a sour flavour. 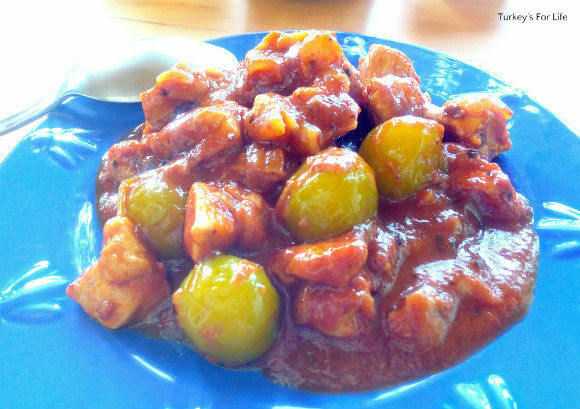 Some erik tavası recipes have a good dose of sugar in there, too, to make a sweet and sour sauce. We’re not big on sugar so we used local honey instead which gave the sauce a sweet thickness. And the meaning of the word ‘tava?’ Well, that’s a frying pan or skillet. Turkish cuisine has a whole range of ‘tava’ dishes that you will often see on restaurant menus around the country. Erik tavası was a new one on us, though. Okay, let’s make erik tavası. Our erik tavası recipe uses chicken rather than beef. The combination of sour erik and sweet honey works perfectly. Add the olive oil to a frying pan and heat gently before adding your onion. Gently sautee the onion until it starts to sweat. Now add your chicken and sautee until cooked. Add your honey and stir into the juices before adding your salça. Give the mixture a good stir so that the salça has coated your chicken and onion. Now add the hot water and allspice and stir until you have a sauce. Add your whole garlic cloves and simmer for 10 mins. Now add your erik and simmer for another 10 mins. Meanwhile, pre heat your oven to 220 degrees celsius. Add your erik tavası to a shallow oven proof dish so that your erik are peeping out of the sauce. Place in the top of the oven for 4-5 minutes until your erik brown slightly. As with all of our recipes, the calorie count is a guideline. It depends how much or how little you use of each ingredient. Some erik tavası recipes don't use any sweetening ingredients so you can leave out the sugar or honey if you like. You want your erik to remain whole so keep an eye on them as they are simmering. We finished our erik tavası off in the oven but this is optional. You can serve it straight from the pan if you wish. Feel free to add more hot water to your erik tavası if you want a thinner sauce. And that’s it! Erik tavası – especially when made with chicken breast rather than beef – is a healthy recipe. Low in calories and low in fat, too. And as well as all that, it’s super tasty. A true seasonal recipe that we’ll only be able to make in late April through to early June. And then we’ll have to wait again for another year. That’s why we love seasonal cooking; looking forward to the arrival of particular fruits and vegetables so we can once more indulge in our favourite recipes for a short time. If you’re elsewhere in the world, your erik or greengage might be out at a different time of year. August, apparently, is the time of year when you’ll be able to make erik tavası – or some classic British dishes – in the UK. For this erik tavası recipe, we’ve said it serves four people. If you’re eating it just as it is, you’ll get two or three large servings. It will serve four people if you have a side serving of Turkish rice. And don’t worry too much about the sauce. If you want a thicker sauce (ours is quite thick and sticky, as you can see), you can add a bit more salça and honey. Some erik tavası recipes have a light, thin sauce. If you’d prefer your erik tavası like this, just use more water than stated in the recipe. Our recipe for erik tavası is finished off in a hot oven for a few minutes. This is completely optional and you can serve straight from the pan if you like. We like our erik to get a little charred on top and it’s just nice to serve at the table in a hot dish so that people can help themselves as and when. If you want to make other Turkish dishes, visit our growing Turkish recipe collection for lots of other ideas.